Hello! I apologise to my readers for not having written much in a long time. I am working on multiple research projects at the moment besides teaching and writing duties as always. Anyway I though I would take five just to share my excitement about attending the Tadasu Kanjin Noh at Shimogamo Shrine this Saturday 30th of May 2015. 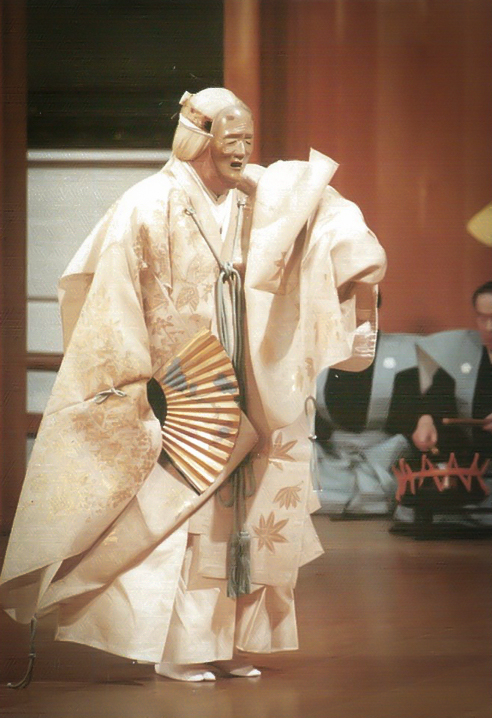 I would love to tell you more about the place, the play and the importance of kanjin (subscription) performances in Noh but, alas, no time for that. Just a few key features: open air performance; hashigakari bridge installed behind the musicians as it was in the olden days (a long long time ago); the iemoto of the Kanze School (Kanze Kiyokazu) dances the Noh Kamo with an impressive lineup of top-notch performers; it is expensive but the money goes towards the renovation of the Shimogamo Shrine. What I am going to do in place of extensive writing is to shamelessly copy/paste the English info on the organisers’ website so that people in the area who are interested can easily find their way to the booking system. Situated on the north eastern (inauspicious) side of the ancient capital, the Tadasu area was traditionally a place for conducting purification ceremonies. Tadasu no Mori (literally “Forest of Correction”), Shimogamo Shrine’s sacred grove, was believed to be a residence of a guardian deity which “corrects” (tadasu) the malign influences. 550 years ago, there was a famous performance of Sarugaku (a precursor of Noh) held at the Tadasu area for the purpose of temple solicitation. For Shimogamo shrine, 2015 is a year of “Shikinen Sengu”, a renovation which is done according to an ancient tradition every 21 years. Let’s take this important year as an opportunity to once again feel the beauty of Japanese culture. 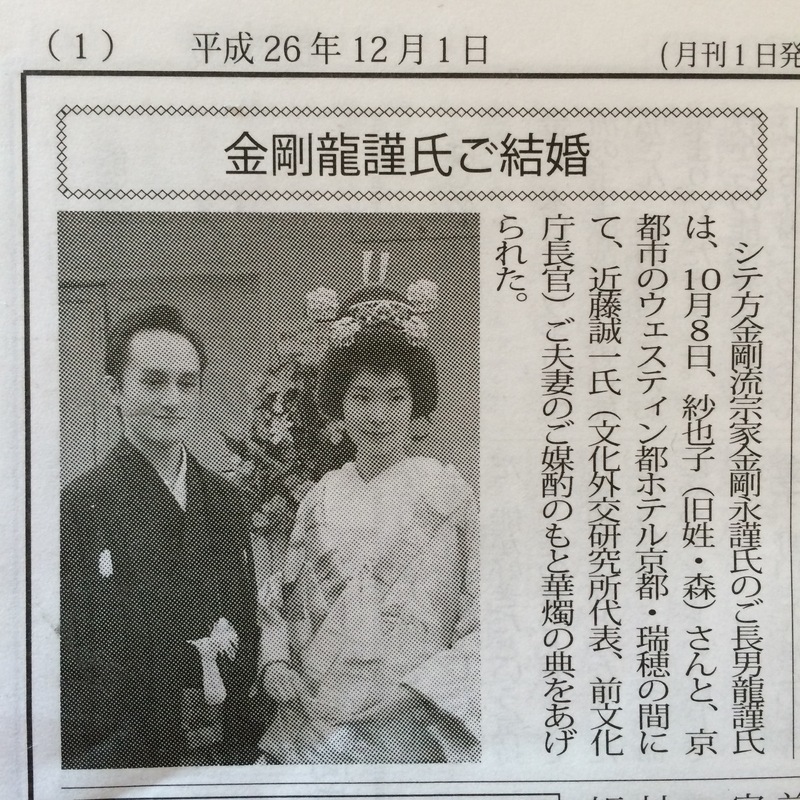 This month’s issue of the Nōgaku Times features the marriage of the waka-sōke (son of the iemoto Head Master) Kongō Tatsunori with Mori Sayako, which was celebrated on October 8th in Kyoto. 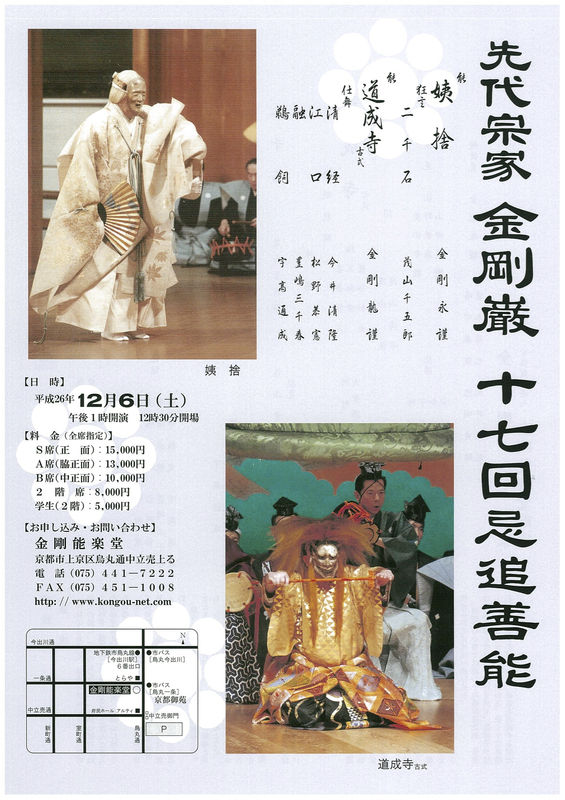 On Saturday 6th December 2014 from 13:00 to 17:00 the 17th Memorial Performance commemorating the late Iemoto (Head Master) Kongo Iwao II will take place at the Kongō Noh Theatre in Kyoto. 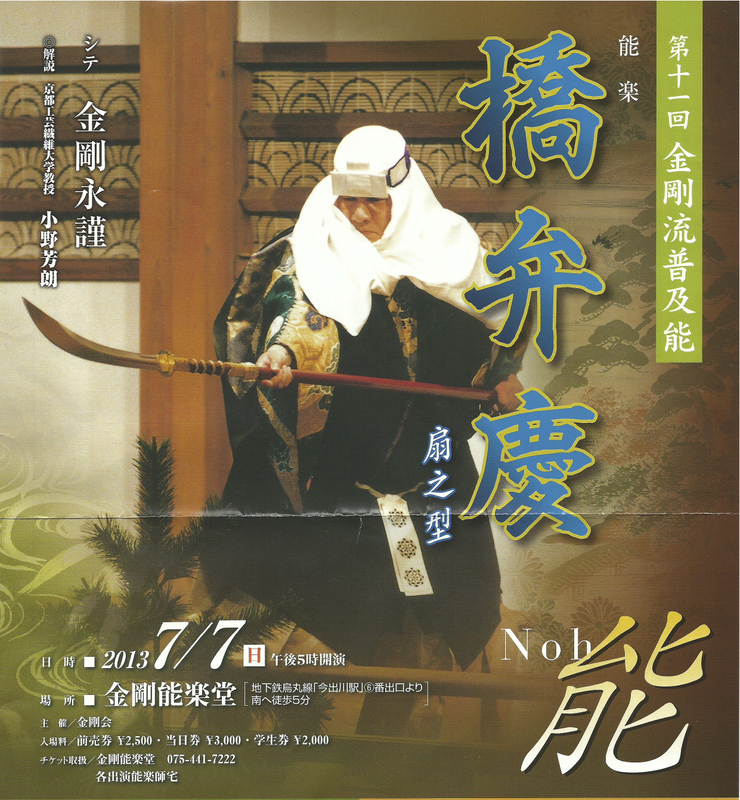 This exceptional event will feature two special plays: Obasute, starring the current Iemoto, Kongō Hisanori, and Dōjō-ji (koshiki version) starring his son, Kongō Tatsunori. (See full program below. If you are interested in purchasing a ticket, contact me here). Obasute, by Zeami Motokiyo is one of the highest ranking plays in the Noh repertoire, and is based on the ancient Japanese legend of obasute-yama, a mountain where the elderly were abandoned by their own relatives, and left there to die. The legend of obasute-yama has been popularised by the famous film The Ballad of Narayama by Kinoshita Keisuke (1958 remade by Imamura Shōhei in 1983). In the Noh play Obasute, the spirit of a woman who was abandoned on Obasute-yama appears to a traveller who is visiting the area, and describes how her loneliness prevent her to break away from her attachments to this world and reach enlightenment. The play is pervaded by the imagery of the full moon, a buddhist symbol of enlightenment, also associated to the Seishi-bosatsu, Bodhisattva of Wisdom and companion of Buddha Amida. Time: Saturday 6th December 2014 – 13:00 to 17:00. Doors open at 12:30. 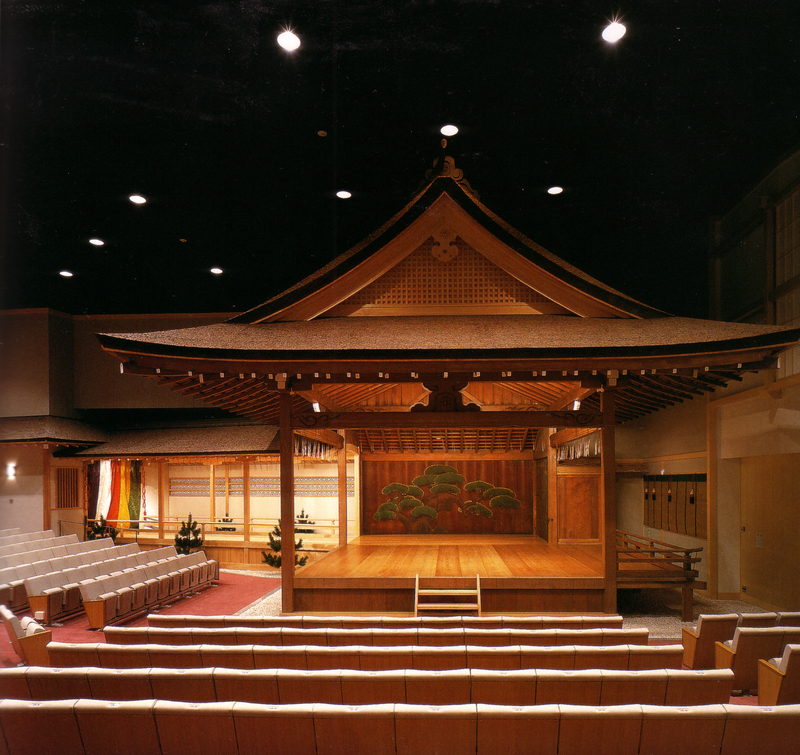 Place: Kongō Noh Theatre, Kyoto. Noh: Obasute. Shite: Kongō Hisanori; Waki: Hōshō Kan; Flute: Sugi Ichikazu; Shoulder drum: Sowa Hiroshi; Hip drum: Kamei Tadao; Stick drum: Maekawa Mitsunaga. Kyōgen: Jisenseki. Shite: Shigeyama Sengorō: Ado: Shigeyama Dōji. Noh: Dōjō-ji (koshiki) Shite: Kongō Tatsunori. 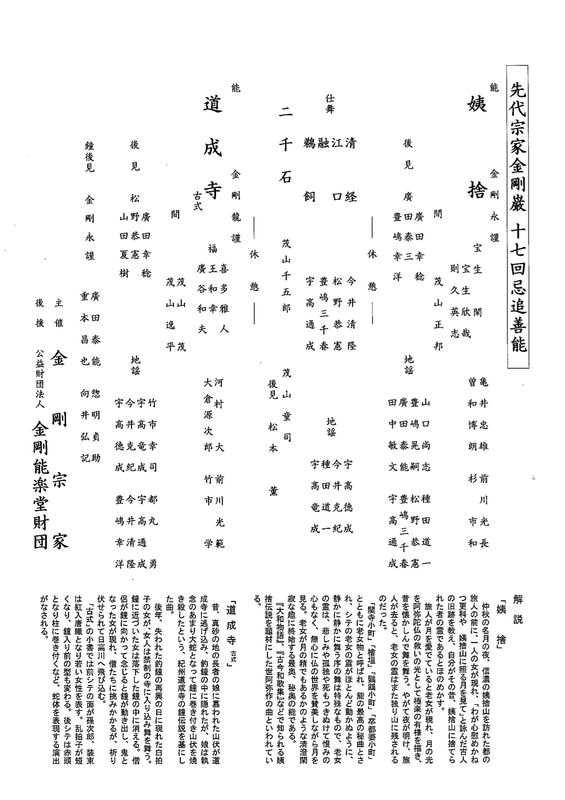 Waki: Fukuō Kazuyuki; Flute: Takeichi Manabu; Shoulder drum: Okura Genjirō; Hip Drum: Kawamura Masaru; Stick drum: Maekawa Mitsunori. 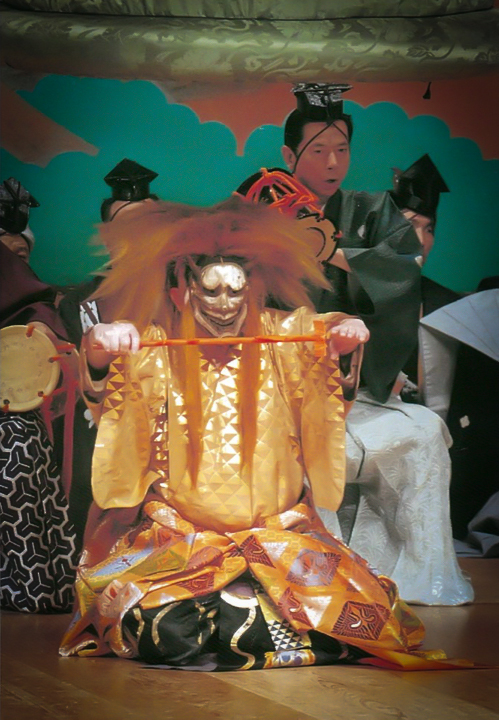 On Sunday 7 July 2013 at 17:00 the Iemoto Kongo Hisanori will perform the Noh Hashi-Benkei at the Kongo Noh Theatre in Kyoto. The performance is offered at the special price of 2,500yen with advanced booking so don’t hesitate to contact me if you want to reserve a ticket. 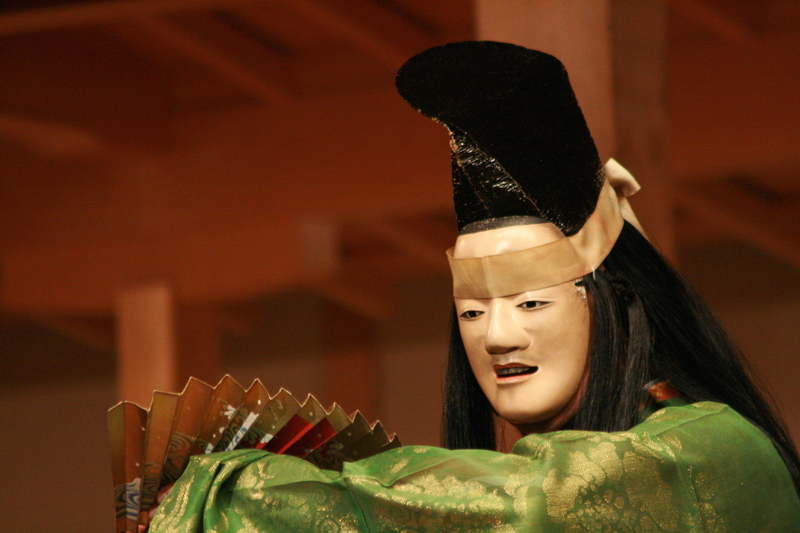 Fukyu-Noh is a regular summer event aimed at introducing Noh to young/new spectators. The Noh will be preceded by a greeting from our teacher, Udaka Michishige (Vice-Director of the Kongo-kai) and by a short explanation by Prof. Ono Yoshiro (Kyoto Institute of Technology).